With just one year of study, the Diploma of Applied Information Technology from La Trobe University can give you the IT qualification you need to start an exciting career. If you want the core entry-level skills and knowledge necessary for help desk and web support roles, this course is for you. Through La Trobe’s nested degree program, you’ll enrol in the Bachelor of Applied Information Technology but have the option to exit with a Diploma qualification after successfully completing one year of full-time study. Throughout the flexible online course, you’ll gain a solid understanding of fundamental IT concepts and their practical applications. From programming to databases to network engineering, the skills you acquire will be particularly desirable to potential employers. So what are you waiting for? Take the first step on the path towards your IT career today! Learn with one of Australia’s pioneers in education, La Trobe University and trust over 50 years of experience! Graduate with an applied degree in IT and join over 35,000 students who have been taught by some of the best, or opt to undertake an applied degree in business and gain a variety of new skills that you can apply just about anywhere. 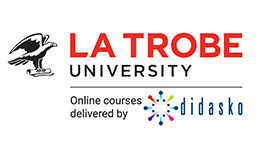 Whatever you study, La Trobe are committed to offering students an engaging, flexible and practical learning experience with their 100% online curriculum. This means you can enjoy the ease of studying at a time and place that’s convenient for you. As La Trobe’s motto would say, “whoever seeks shall find”, so discovering a new career can be just a click away. Studying with La Trobe means you’ll have access to support staff and academic teams who will not only guide you through your studies, but also help you get job-ready. You’ve got the qualification, now what? Their Career Support Centre will help you conquer your career goals and land your dream job... they’ll even help you prepare a standout CV and cover letter! Upon successful completion of this course you will receive a Diploma of Applied Information Technology from La Trobe University. Students are able to exit the Bachelor of Applied Information Technology after successfully completing one year of study in order to obtain the Diploma. Graduates are then able to pursue a range of entry-level IT positions, such as help desk and web support roles, with an expected income of $50K–$60K. La Trobe University also offers an upfront payment option. Fill out this form and a study consultant from La Trobe University will get back to you.